I’m a busy bee. On Thursday I was rushing to get ready to go out, blow drying my hair, finding clean clothes, tidying up, rushing round like a mad thing. I pulled my coat on and ran out of the house, I was running very late for play group and I needed to pick my son up. Half way there I realised I’d not stuck a nicotine patch on, too late to turn back I decided I could manage the morning without. We got home at lunchtime. Between persuading a sandwich into a toddler and tidying the house in preparation for it being trashed during our afternoon play date, and the early arrival of said play date, I forgot to stick the nicotine patch on again. By the time I’d remembered it was past tea time and I thought it wasn’t worth it. Since then I’ve decided to purposefully go without, always with the option of putting one on if need be. When I first gave up in 2004 (for 9 years) I used patches. I had a pretty terrible time with them, I used to have incredibly vivid dreams about killing people and my skin itched like hell underneath the patches. I used them for two weeks just to break the spell, and not being able to hack it anymore just stopped using them. It looks like I’ve repeated that pattern, but rather than having a terrible time, this time the patches were fine, great in fact. Without any fuss or bother I’ve given up smoking and given up the nicotine replacement therapy. Don’t let that fool you into thinking I’ve had an easy time giving up, because I really haven’t. I’d still cheerfully kill for a fag. Sucking in the gorgeous smoky loveliness. The love never really goes away, but being parted from it does become less painful and less of an issue. I’m not saying that I’ve been successful this time round, the signs are good though and if I can make it through to 2014 smoke free then I can start to relax again. I probably do feel a bit better for it, but again that’s early days. I loved smoking, really loved it. If I can give up then I’m pretty sure you can too. Make the decision, summon up the willpower. Pick some nicotine replacement therapy which will work for you and go for it. Go on, give it a go. 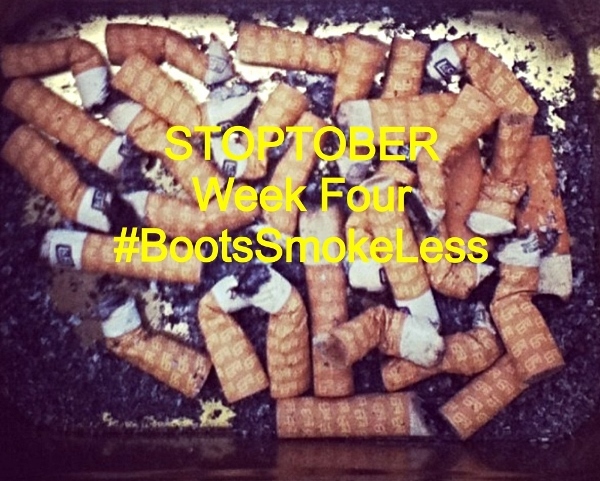 This entry was posted in Health and tagged Smoking cessation, Stoptober. Bookmark the permalink.